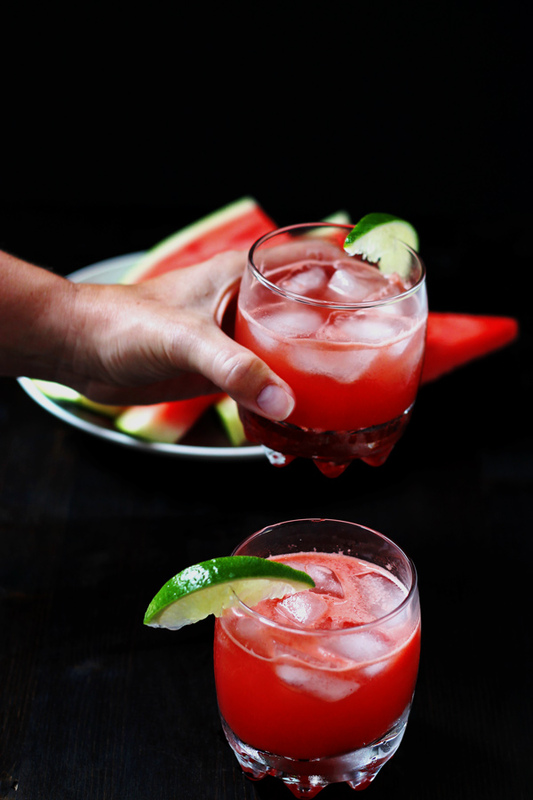 We have seen a few Watermelon Margaritas on other blogs out there lately so we initially thought that maybe we should post something else… But then we were making them anyways and they are just too dang good not to share with you! They also look amazing! Don’t they? The process of getting the watermelon juiced can be a little time consuming but I promise you, its well worth it! Have you heard of those square watermelons that they have out right now? They come from Japan and right now they are selling for $200 in Vancouver! Apparently they are so pricy because only a few hundred of them are grown every year. The Japanese grow these watermelon by placing the fruit in a clear, square plastic box and the fruit just grows to the shape of the box. I have seen a heart shaped one too actually. Its kind of neat, kind of silly lol, but it makes for a good story! I found a website that sells the clear plastic boxes and heart shaped watermelon molds so you could grow your own if you like. The company actually makes all kinds of fruit molds like a Buddha mold for pears, and a star shaped cucumber mould! In case this is something you would like to try, heres the link to the site. www.fruitmould.com If you try this, you have to send us a picture! We made these Watermelon Margaritas at Debbies house and while we were making and photographing them, Mark came home from work. He came in the house with all his work gear on (hes a logger so hes usually pretty dirty when he gets home. And thirsty!) and asked what was for dinner. Since Debbie and I had been making appies all day, we had kind of forgot to make dinner. And then he spotted the drinks I was taking pictures of and asked, “Who are those for?” Debbie told him that one was for him as soon as we were done taking pictures. Well you should hear the half-joking comments and bellyaching that we have had to put up with from the peanut gallery since we started this blog! About having to wait SO long to eat or drink because we have to photograph everything first… The peanut gallery being mostly Jessica and Mark! Im sure you food bloggers out there reading this can empathize. We just smile at them and tell them that if they want any of what we have, they better pipe down lol. Debbie and I had already been sipping on one. 😉 There are perks to being the cooks and the bartenders! Well we have to taste everything before we serve it, right? So anyways, Mark is laughing but he pipes down and shortly after he gets a drink. I think he was pretty surprised at how good it tasted. He loves a good margarita but hes not too into the really fruity drinks. But this one he loved! You will to! 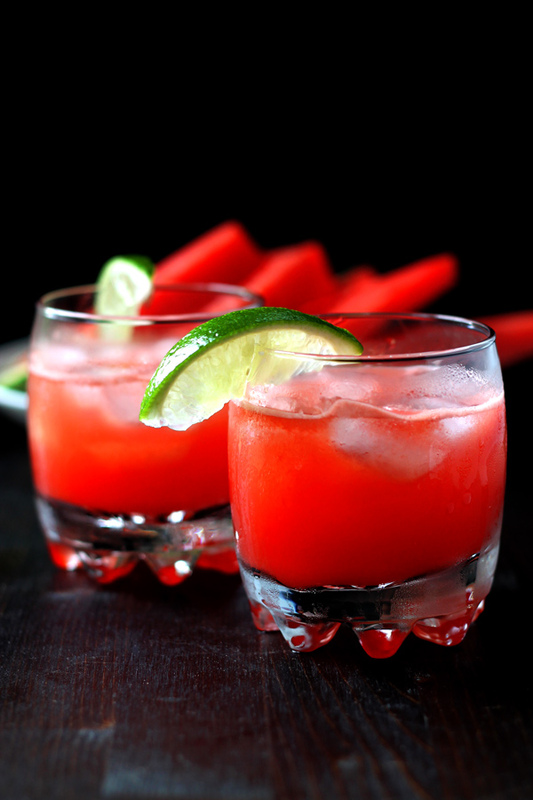 Put your watermelon into a tall glass or shaker and muddle it up till its very juicy. Or you can put the watermelon into a blender or food processor to blend it up really fine. 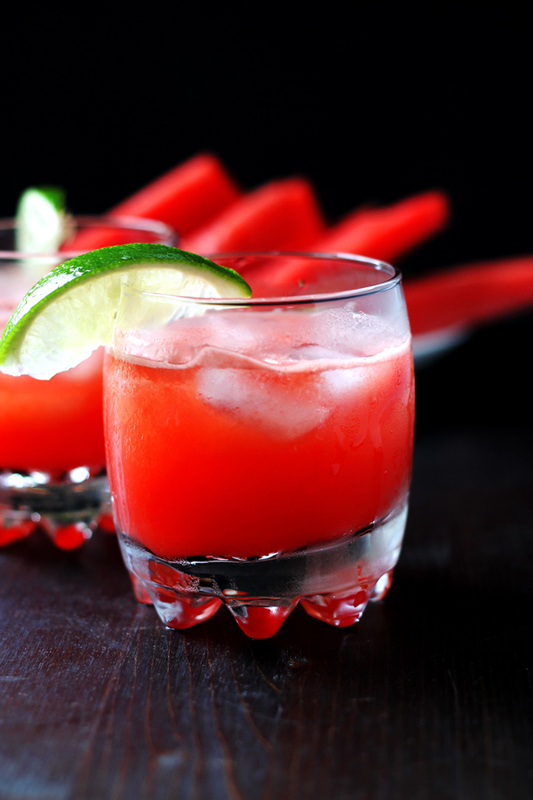 Strain the watermelon juice into a separate container. Dip a short glass into some lime juice or run a lime wedge around the top of the glass. Dip it in the coarse salt to rim the glass. Add the tequila, triple sec and lime juice. 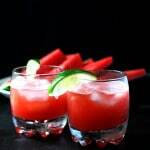 Then add the watermelon juice and give it a stir. Now taste it and start making your next one cuz the first ones going to go really fast!